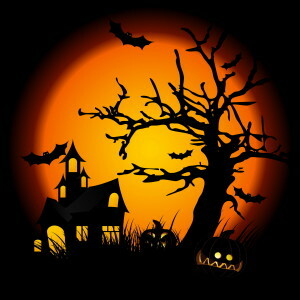 Whether you call it Halloween, Samhain, All Hallow’s Eve, Harvest or just Autumn, I LOVE this time of year! So it’s no wonder that I tend to make a lot of Halloween inspired jewelry in my PhoenixFire Designs etsy shop! The most classically Halloween of these items is my spooky Halloween Full Moon Tree of Life Pendant. 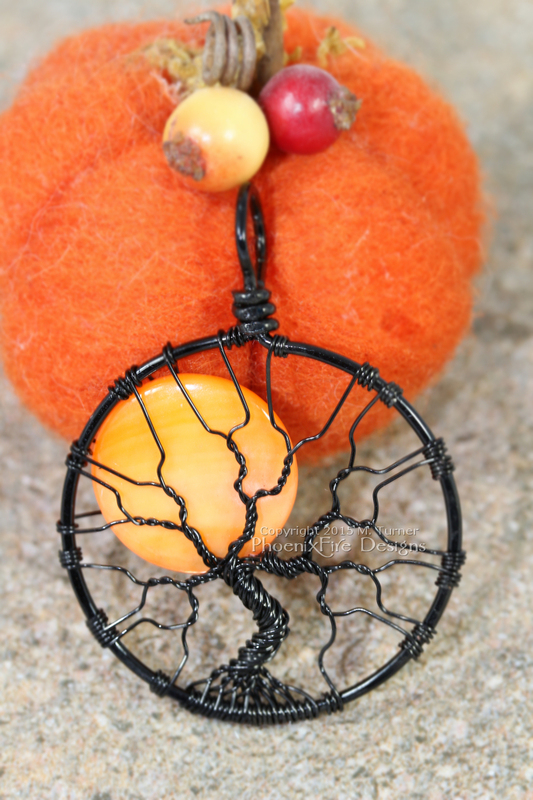 Handmade and wire wrapped in black wire with an orange harvest moon peeking out from behind the bare branches, this one just screams Halloween! 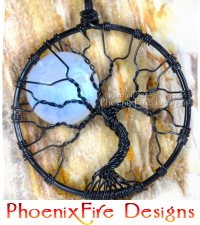 Spooky Halloween Full Moon Tree of Life Pendant with orange harvest moon wire wrapped in black wire by PhoenixFire Designs. 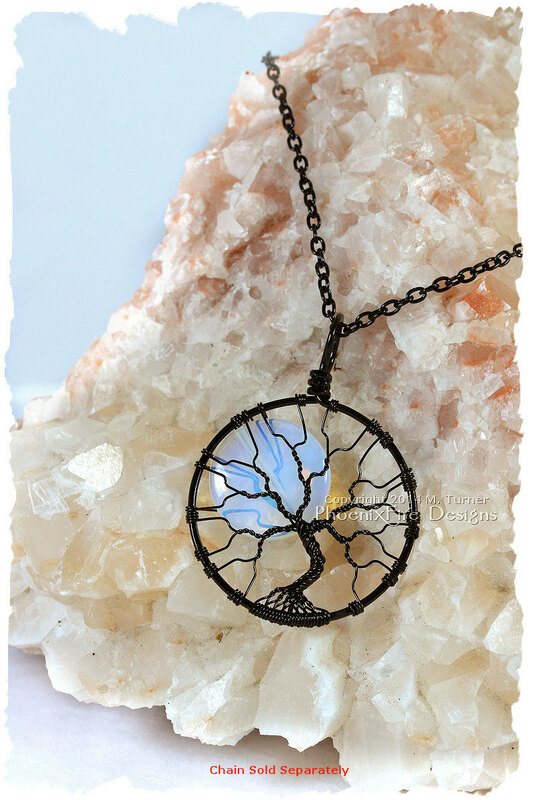 The single most popular item in my PhoenixFire Designs shop by far, is the #1 best selling and #1 most wished for Opalite Rainbow Moonstone Full Moon Tree of Life Pendant. Though it is available in four wire colors (including silver, gunmetal, brown and black) the black wire wrapped version is the most popular. What I like about this piece is that it’s wonderfully suitable for Halloween and more gothic styles but it’s also striking and lovely enough to be worn all year long! 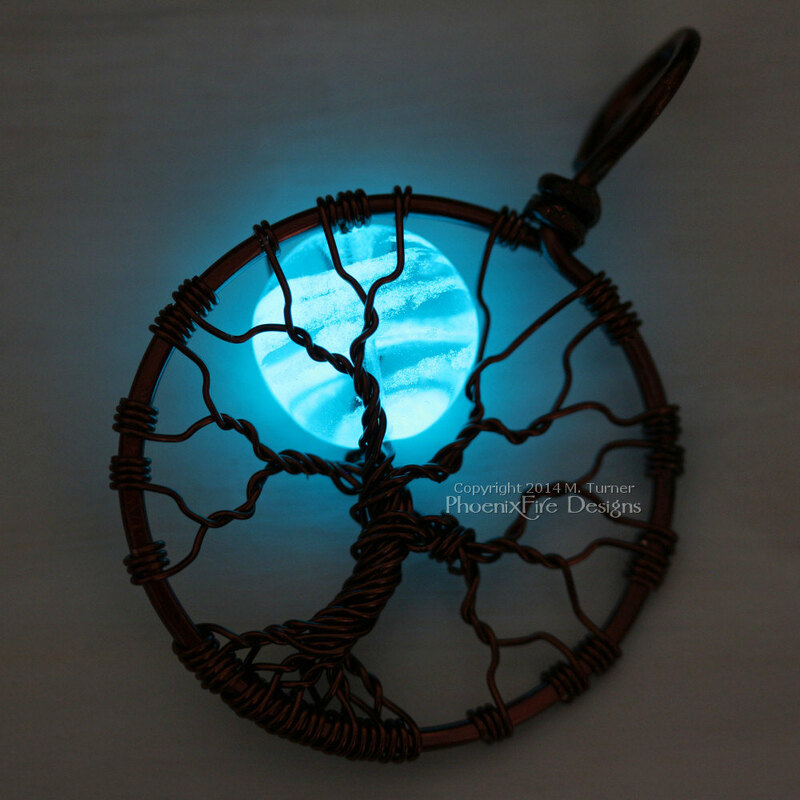 Another fun item that is inspired by Halloween but can be enjoyed throughout all seasons is my Glow in the Dark Blue Moon Tree of Life Pendant! This is one of several permenant glow in the dark necklaces I have in my shop and this specific tree of life pendant features a teal blue moon that is a glowing blue moon after exposure to light! Wire wrapped glow in the dark blue moon tree of life pendant, glowing blue moon, glow in the dark jewelry, glowing necklace by PhoenixFire Designs. 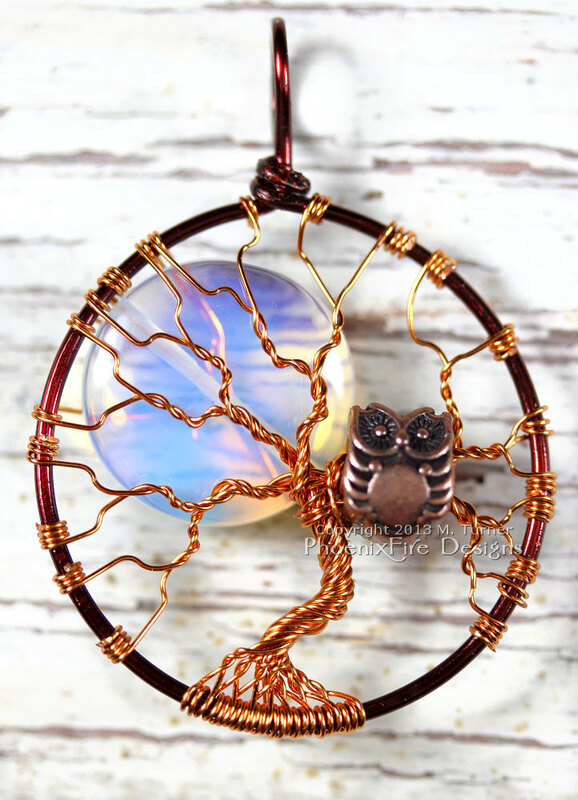 Two tone, mixed metal wire wrapped brown and copper tree of life pendant with large opalite rainbow moonstone full moon and copper owl within the branches makes a spooky Halloween tree of life necklace! By PhoenixFire Designs. This is just the barest tip of the Halloween iceberg!! There are so many more Autumn Accessories, Harvest Moon Necklaces and Halloween Pendants and Jewelry in the PhoenixFire Designs shop just waiting to be discovered! 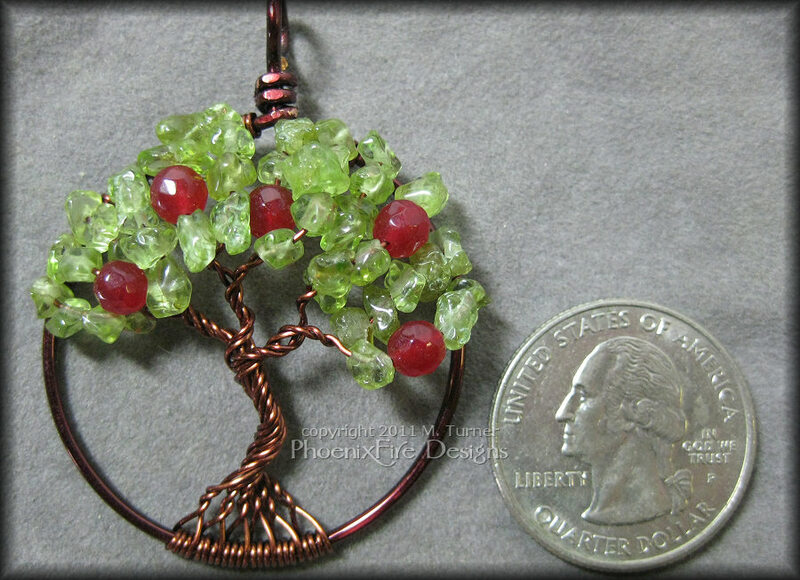 Shop PhoenixFire Designs on Etsy – or Contact us for Custom Jewelry! Every so often, I run a sale or offer a discount code or coupon code in my PhoenixFire Designs etsy shop. 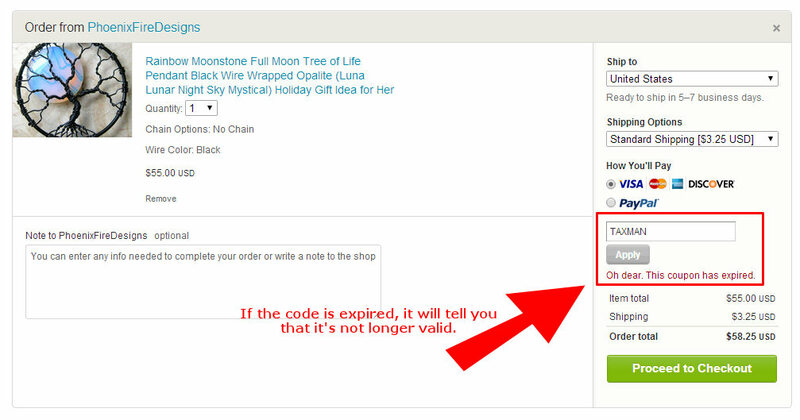 And etsy itself doesn’t seem to have very helpful how-to or information on how to use discount codes or coupon codes. If you’ve been confused in the past or wondered how to use a promo code, here’s a visual how to to help. It’s actually pretty simple but not obvious. There’s a little link, “Apply shop coupon code” right under the payment type in your cart. You click that, and a text field will open for you to type in the code. Hit “apply” and it will take the discount off automatically. If the code is expired or invalid, it will let you know that too. Add item to cart. Then click the “apply shop coupon code” link found under the payment options. A text box will open for you to enter the code, then click the “apply” button. After you click “apply” the cart will automatically update to reflect the discount and new total. If the coupon code is expired, it will tell you that it’s no longer valid. The “notes to seller” field is usually reserved for customization information, messages to include with gift orders, etc. Finally, it’s important NOT to put a coupon code in the “notes to seller” field as it will NOT apply the discount and sellers CANNOT apply the discount for you after you’ve checked out. 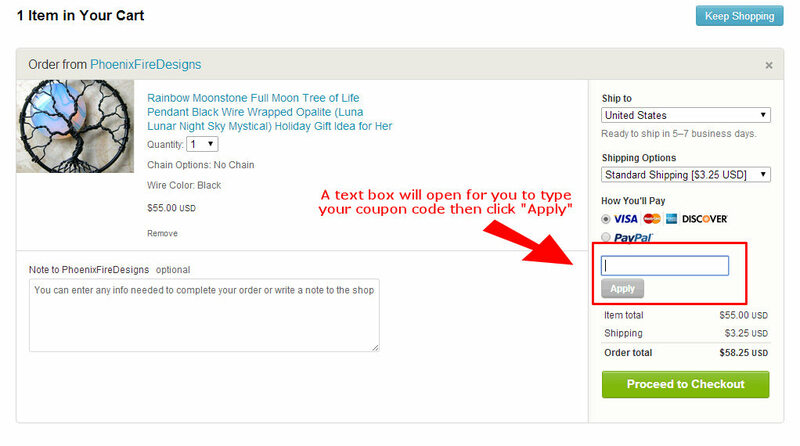 Hopefully, this helps clarify how to use a coupon code, discount code, promo code or other discount when buying on etsy. As always, you can find our PhoenixFire Designs shop on etsy here! After a long time gone from the shop, I’m please to say my Apple Tree has returned! No forbidden fruit here! 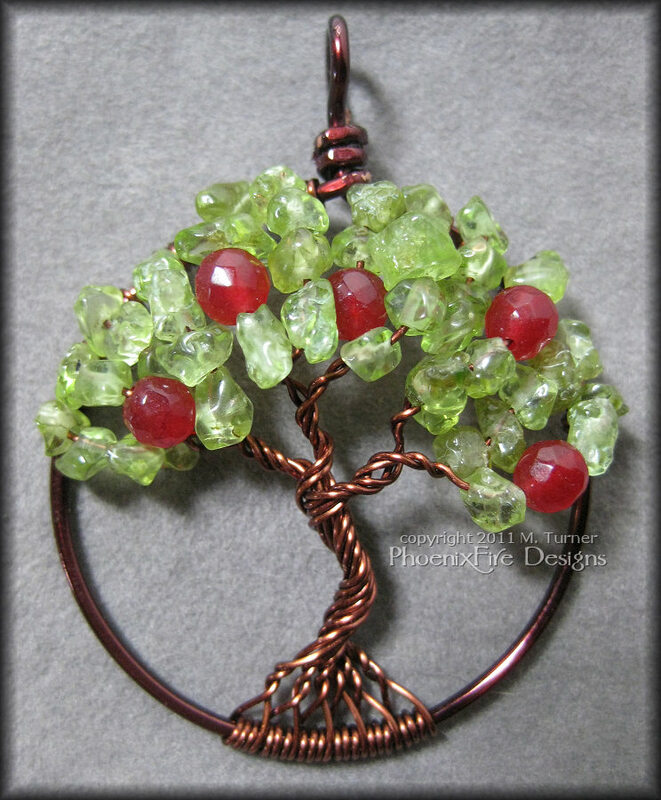 This adorable Apple Tree Pendant features genuine Peridot Gemstone leaves with faceted Ruby round apples set in brown wire. Apple trees always remind me of Autumn as a child growing up in rural, Western Pennsylvania. My uncle had a farm and an apple orchard. Each year, my Mom would climb the trees and toss apples down to me to gather in laundry baskets (which always did double duty during harvest season!) Nothing was every better than an apple fresh from the tree on a crisp, fall day! Pendant available HERE in my shop.